Divas, foregone conclusions and allegedly the best semi-final line up of the year? Ummm......not quite. For Melodifestivalen continues to throw up surprises week after week. Despite what seemed like a showstopping performance (if IMHO some disastrous styling), Sarah Dawn Finer didn't make it to Globen. But she will get there of course, only via Andra Chansen. It was a strange one tonight in Malmo. It kicked off with Petra Mede performing a version of "Lyssna Till Ditt Hjarta". I thought her dress was lovely tonight too. Song 1: "Love Love Love" - Agnes. I've never really liked her, if only for the reason she deprived my beloved Sebastian in "Idol" - but that turned out to be a good thing of course. Anyway tonight I love-love-loved her gold catsuit and she really put on a good show. Song 2: "Higher" - Star Pilots. Laugh if you must, but this was my favourite of the night, and was for me the most memorable song of the night but then I've always liked "Waiting For A Star To Fall" lol. :) Anyway the staging and singing was a bit dodgy at times, but you can't keep a good dance-pop song down. Song 3: "Du är älskad där du går" - Susanne Alfvengren. Another Pling/Bobby/Wikstrom effort in the same vein as Shirley's song from Week 1. A bit dull, and no surprise it came last. Song 5: "Sweet Kissin' In The Moonlight" - Thorleifs. So you've got new-dansband (Scotts) so how about some old-dansband? Not so much old, more prehistoric schlager which was more 1959 than 2009. Song 6: "Moving On" - Sarah Dawn Finer. She teamed up with the all-conquering Fredrik Kempe to produce a big showstopping performance complete with wind machine. There is no doubt she is a very good singer with a lovely restrained vocal style. The outfit was so-not-a-good-look though, and was she taking tips from Maria H S on just how much to "reveal"? Song 7: "Esta Noche" - Next 3. Isn't that reggaeton style so 2007? Or even 2006? This came 6th, but it certainly wasn't better than Anna and Maria's duet. Song 8: "La Voix" - Malena Ernman. When I heard the sound clip earlier today I just knew this was going all the way to Globen. I liked bits of it and hated other bits of it. Personally I can't really stand this pop-opera mix, and isn't that so 2007? Melodifestivalen flashback reached the 1990s - some real stinkers tonight!! Of course they also showed some of the most famous 1990s MF songs and this culminated in tonight's interval act, none other than Darin, singing Jan Johansen's "Se På Mej" from 1995. Excuse me for feeling a little emotional, but I had a little lump in my throat watching this and I thought he was just lovely, although admittedly he struggled towards the end. Duels: Star Pilots vs Agnes / Sarah Dawn Finer vs Malena Ernman. Result: Agnes and Malena to Globen, Star Pilots and Sarah to Andra Chansen. Now there's a shock! I thought SDF had it in the bag but apparently not. She did get the international jury vote tonight. Yay for Star Pilots though, plagiarism or not, who cares!! Andra Chansen next week. One duel after another, maximum confusion (and inevitable disappointment) guaranteed. A lot has been written in various places about how good this week's semi-final is, however I'll reserve my judgement till I've actually watched it. I agree though that Sarah Dawn is in with a very very good chance - maybe it could be the year of the ballad? Although I always enjoy MF - the show is always bigger than the sum of its parts I guess - I'm coming to terms with the idea that this year's contest hasn't been as great as it could have been. I ask myself how many of these songs will I listen to after the contest is over? Very few, I reckon. Ting a ling, ting a ling.....I'll be back on here later with some thoughts on tonight's extravaganza. Did you really think that you could keep Mendez down? I have no complaint with the 2002 winner - the fab "Never Let It Go" by Afro-Dite - but "Adrenaline" by Mendez was very lively and likeable and I still play it a lot. With backing vocals by Pablo Cepeda who had his own 5 minutes of MF fame in 2006 with "La Chica de la Copa", which I also rather liked too. ...it's all about MF in Malmo, the one I don't particularly care about as I don't have anyone to cheer on this week so I'll be watching as a neutral and you never know, maybe some of the songs might surprise me! Regular readers will know that I haven't been updating this blog as often as I'd like, so this weekend I'm determined to bring it back to some former glories with charts updates and stuff. Probably Sunday if I'm organised enough. The Guardian reports here that one of my favourite old rock bands are reforming for a European tour this summer. February: short little month. So it's appropriate that this month's review of what I've been watching is almost as short. I can't believe how bad TV is right now. All reality rubbish/talent shows/cookery/makeovers/property/antiques blah blah blah. If a little spaceman came down from Mars and asked, 'show me one programme which sums up everything that's wrong with British TV', I'd hit the ITV button on Saturday night and show them "Ant and Dec's Saturday Night Takeaway" This used to be good Saturday night entertainment once upon a time....till it turned into a retirement home for the celebrity-reality-z list mob. Take it away, now preferably. The other thing wrong with ITV is....Piers Morgan. Now they've given him a chat show, so he can chat to all his little circle of celeb-reality friends. Before this though, they had him hanging out in Dubai, Monte Carlo and Hollywood. In a guilty-pleasure kind of way I watched these three programmes, if only to see how the other half live, and just to see Monte Carlo again. One more appealing explorer is Billy Connolly. In "Journey To The Edge Of The World" he's travelling from the Atlantic to the Pacific, via the top of Canada. It's a winning mix of informative and humorous television: maybe there is hope for ITV after all if they can make more programmes like this. The revival-mania which was all over the world of pop is now....all over the world of TV shows. So I give you "90210" (E-4, Mondays) which is an updated version of one of my old faves "Beverly Hills 90210", with added Kelly and Brenda for those who remember it first time round. The new version may not have the magic, but it's refreshingly corny and innocent compared to other teen-shows. I know I'm too old for this, but it's a cheesy way to pass an hour. Corry: Platt-Windass feud. Becky & Steve. Ken & Stephanie Beacham. The factory's got a new owner - him from "Queer As Folk" no less! Hollyoaks: Amy & Ste. McQueens 'on the rob'. Sasha fancies Warren. Warren looking tortured. "Control" was on Sky Premiere and I thought it was exceptional. 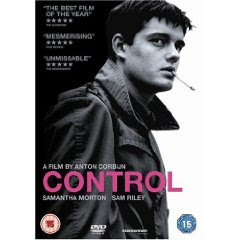 It was the story of Ian Curtis, lead singer in Joy Division, with an outstanding performance by Sam Riley in the leading role. Such an amazing attention to detail, too: the actors playing the band members actually played their own instruments. An honest and gripping film from start to finish. Anyway this versatile star managed to show off yet another side to his talents as Alain Moreau, the cheesy club singer who falls in love with a much younger woman. Like many French films it had its share of long, lingering meaningful looks and excessive smoking (is the French film industry sponsored by big tobacco I wonder??). Anyway I couldn't really understand why anyone would fancy Mr D, but 'chacun à son goût' I suppose. Meant to feature this a long time ago on Retro Saturday but never got round to it till now. Her best known song is "Bette Davis Eyes" but for me this beat it every time. From 1981, a smooth, synthesized, underrated classic of its time. The video is reassuringly dated!! Bit late with this ...it should be Retro Sunday but better late than never. I didn't really appreciate it at the time but it has definitely matured with age! "Serial Lovers" - Sebastian Karlsson: catchy rock-pop follow-up to "My Getaway" which, I think, is a return to form. "Speakerbox" - Signmark feat. Osmo Ikonen: still my favourite national finals non-winner of the 2009 ESC season. At the moment I can say that there is no danger of me ever tiring of this, and its position in the EuropeCrazy 2009-50 is clearly assured, even at this early stage of the year. "The Escapologist" - Sugarplum Fairy: played this a lot this week. Top quality Swedish pop-rock - need I say more?? "Get On Your Boots" - U2: it's in the playlist, but with some reservations....I was unimpressed with their Brits rendition of this, although on record it's worth a listen although still a long way from their best. "Freaking Out" - September: how good would it be if she ever did Melodifestivalen? Great dance-pop which the Swedes seem to have such a natural talent for. "Just Dance" - Lady GaGa: OK so we're all moving onto "Poker Face" by now (unless you're my local radio station) but I still whoop and throw my hands in the air when this comes on the radio! "We Are The People" - Empire of the Sun: the album finally dropped through my letterbox two days ago (review to follow next week) and this is, yet again, my favourite track from it. "Astronaut" - Salem Al Fakir: extremely lovely new single, released in Sweden on 04.03.09 with the album to follow on 18.03.09. Oh and did I tell you I was going to his Gothenburg concert.....????? Host Petra Mede was in fine form - I'm getting used to her style now, of course she's still not as good as Kristian Luuk but her spiky and sarcastic gags are beginning to grow on me. "The Queen" - Velvet: I was very impressed by this on the night, more than I expected. Very September-ish with huge hit potential, written by Tony Nilsson - good pedigree! - and she sang it very well. So why didn't it quallify then??? "I Need U" - Rigo & Topaz Sound featuring Red Fox: lively, enthusiastic and professional. I like the staging this year, and it certainly did this act a favour. "Baby, Goodbye" - E.M.D. : a.k.a. re-enactment of Sam Sparro's "Black and Gold" video....still if you're going to borrow then borrow from the best I say! I loved what I heard of this although lost half of it to buffering. Vocally spot-on, very catchy and I was cheering this all the way to Globen tonight. "Du Vinner Över Mig!" - Mikael Rickfors: written by schlager-king G:son, don't you know! A bit of the "My Sharona" to this one, he did his best but I didn't really get it. "Här För Mig Själv" - Maja Gullstrand: pleasant enough bossa-nova flavoured interlude although still had no-hoper written over it. Can't deny it was quite sweet though. "Alla" - Sofia: This didn't do anything for me, energetic though it was. That Greek-flavour had lost its taste a long time ago, as everything post-"My Number One" has a lot to answer for and has annoyed me in recent years at ESC. And so to the act and song I really wanted to see...."You're Not Alone" - BWO: quite a haunting, spellbinding ballad, in the same vein as last year's ESC winner "Believe". An atmospheric song, staged with laser-sticks and page-boy haircuts, and Martin was lovely as ever, however that grey spacesuit did him no favours. Interval Act - the weekly MF flashback reached the 1980s - you could tell with all that big hair - Style's "Dover-Calais" for example. Results: Rigo etc etc and E.M.D. to duel no.1: happily it's E.M.D. to Globen, with Rigo & co to Andra Chansen. Duel no.2: Molly vs BWO - completely unsurprising result as Molly goes to Globen, with BWO (I blame those grey outfits) to Andra Chansen. Still, at least I'll see Martin again there....! What really shocked me tonight was that international jury vote. What did they see in "Alla" by Sofia? Is it just me? OK, heard the song clips now. I haven't really changed my mind about who's going where this week. I totally agree with Poster Girl's comments about the quality of this week's songs here. "The Queen" - Velvet: it's not as good as I expected, don't like it as much as "Mi Amore" or "Deja Vu", but from the pictures I've seen it looks like an extravagantly staged number in Linda-Wagenmakers-big-frock style. "I Got You" - Rigo & the Topaz Sound feat. Red Fox: for some reason reminds me of those 90s songs like "Compliments On Your Kiss" or anything by Chaka Demus & Pliers. Extremely annoying chorus though, and there to make up the numbers. "Så Vill Stjärnorna" - Molly Sanden. Unlike fellow kiddie-popster Amy Diamond, little Molly has finally grown up. This will probably be the "Empty Room" of MF 2009. "Baby, Goodbye" - E.M.D. The most memorable chorus for me this week along with BWO. This week it's all about initials :) Hope there's lots of Danny input to give the song some oomph because I sometimes feel the other two can be a bit lifeless vocally. "Har För Mig Själv" - Maja Gullstrand. And this will probably be the Caroline Wennergren (I think that was her name) of MF 2009. Not much of a song, but I love her hair though! "Du Vinner Över Mig" - Mikael Rickfors. Still a mystery to me why this rock veteran is in MF this year. In the same style as his old hit "Vingar" or Tomas Ledin's material over the last few years, but again an also-ran. "Alla" - Sofia. This didn't do anything for me either - another one for the bottom half of the table. This week's show, from Leksand, kicks off in just under two hours' time. Hoping that there's a good live stream and lots of quality performances. It's the MGP final this week - this has totally passed me by this year for one reason or another, I'll need to listen to the songs tomorrow afternoon. Anyway it's such a foregone conclusion as the boy with the fiddle will walk it. I'll need to get this blog back on track as it's been a bit neglected of late! This blog isn't just about music and telly and stuff, it's also supposed to be about travel. (Of course I spend most of my time listening to music and watching telly whilst I'm saving up for my next holiday!). Anyway I've got some news for you - I'm heading off to Gothenburg (with faithful travelling companion in tow) in eight weeks' time for something pretty special indeed. For I am finally going to a Salem Al Fakir concert, and regular readers of this blog will know how special that is for me. I just wish I could bottle this feeling I have tonight, it's beyond euphoria...! And as I said in an earlier post, it will also be post-Melodifestivalen season, so I'll be bringing the inevitable CDs/DVDs home with me. Anyway we managed to see a lot of the city whilst we were there, amongst other things we had a great night at Liseberg amusement park and went up in the tower for some amazing views of the city, we also spent a fabulous day at the Slottskogen nature park and had an unforgettable experience - seeing our first moose!! This time we'll only be there for a couple of days, but what a couple of days they promise to be. Brits: OK I did say they were foolish predictions!! Haven't seen tonight's show yet - will watch it tomorrow, although I couldn't resist a sneak peek at the Pet Shop Boys' medley which closed the show. A strange mix of unit-shifters and the critically acclaimed. 3 awards for Duffy? Huh? Is it just me? "The Promise" as best single? Now I've long been a GA fan but it's ironic that they should finally win a Brit with (IMHO) their worst single. Still it's not all bad. Scouting For Girls won zilch. Well done PSBs though. I've always loved them, all the way from the original version of "West End Girls" and it's time they got the recognition they deserve which is long, long overdue. 1. Apart from Russell Brand - love him or hate him, but he was brilliant the year he presented the show - there is always a foregone conclusion that the presenters will be rubbish. Two people from some sitcom called "Gavin and Stacey" which I haven't watched, but if it's as funny as these two were, then I wouldn't anticipate cracking a smile. In fact I decided that James Corden - the one who used to be on "Fat Friends" back in the day - is possibly one of the unfunniest people I've seen in years. 2. Live Acts - I was impressed with the fairly high calibre of the live performances on offer, particularly the aforementioned Pet Shop Boys end of show medley which featured guest vocals from the lovely Brandon Flowers and Lady GaGa. Coldplay - as usual they gave it their all, but I wonder how they must have been feeling - knowing that they were (unfairly) going home empty-handed? Kings of Leon were also excellent on "Use Somebody" - what brilliant vocals. My aversion to the Ting Tings prevented me from sitting through their 'who thought of this?' collaboration with Estelle. (I wish Kanye had been there instead - but he wasn't. Have to say his acceptance speech was quite funny though). U2 opened the show with "Get On Your Boots", which - shock horror - I actually quite like - but live, it left me cold, because they always do now. 3. Shock winners: Iron Maiden - Best Live Act! Tonight we're gonna party like it's 1982. Elbow - Critics' favourites of the last year, but Best British Group? A lot of people have never heard of them. (I have, although I've never really investigated their music). Trying to work up enthusiasm for this week's Brit Awards. The annual British music awards ceremony takes place this Wednesday, I'll videotape it and watch it on Thursday night. Here are the nominees, and some of my foolish predictions. British Male Solo Artist: Ian Brown, James Morrison, Paul Weller, Will Young, The Streets. Prediction: Will Young. He may not be topping the charts anymore but you can't deny that he's a quality performer. British Female Solo Artist: Adele, Beth Rowley, Duffy, Estelle, M.I.A. Prediction: Duffy. She sold lots of records, and "the industry" likes that too. Own choice: I'm not really keen on any of them, but if I was pushed then probably Estelle, if only for "American Boy". British Group: Coldplay, Take That, Elbow, Girls Aloud, Radiohead. Prediction: Take That. A loyal fanbase both old and new should do it for them. Own choice: OK I love Take That, I really do, but it's Coldplay for me. British Breakthrough Act: Adele, Duffy, The Last Shadow Puppets, Scouting For Girls, The Ting Tings. Otherwise known as the 'everything that was wrong with new British music last year' category - Shadow Puppets excepted. Own choice: Viva La Vida. British Live Act: Coldplay, Elbow, Iron Maiden, Scouting For Girls, The Verve. International Male Solo Artist: Beck, Neil Diamond, Jay-Z, Kanye West, Seasick Steve. Yes it's diverse, but was that the best they could do? International Album: All the albums by all the International Group nominees. Own choice: How cool would it be if "Dance Wiv Me" won!!! At least we'll get something decent on the night: The Pet Shop Boys will get that long-overdue Lifetime Achievement award and if the rumours are true, they promise a very special live performance. Well we will need something to liven it up. Another week, another MF semi-final, but my timing was a bit off as I missed the first 10 mins due to having to wash the kitchen floor (oh don't even bother asking) anyway I was there in time to see the Lili and Susie comeback. Yes I do remember them from the 80s, yes I do remember them quite fondly, so song 1 - "Show Me Heaven" went down rather well at EuropeCrazy HQ. A high-energy and very professional opening to the 2nd week of the 2009 MF proceedings. I'd decided that this was a qualifier, make no mistake. Song 2 - "Jag Skå Slass i Dina Kvarter!" by Lasse Lindh didn't really do much to change my preconception that he was only there to make up the numbers, although he did well enough and I could imagine listening to this later on and it having a life outwith MF. There was no chance of it progressing in the competition. Jennifer Brown was another once-popular artist making an MF comeback this year, with "Never Been Here Before" co-written by Andreas Johnson/Sebastian Karlsson collaborator Peter Kvint. But despite that, and the exquisite staging of the song - making it look like there were many more than the allocated 8 people on stage - it was probably the major shock of the evening that this song didn't progress. I admit, these postcards are growing on me....H.E.A.T. were heralded with a 'postcard' of "Prison Break" star Peter Stormare wearing one of their t-shirts. I hadn't heard of them till MF, but they presented the first challenge of the night to the expected qualifiers with "1000 Miles" which they absolutely sold and it was no surprise that they've gone all the way to Globen. I like the stage sets this year - they are more customised to each act, rather than the cold staging from 2008. Next on stage, Amy Diamond with "It's My Life" When I learned this was co-written by Lord Alexander Bard, I felt bad for slagging it off earlier. However, Amy is not the divine Martin, she's a little girl and she will always be a little girl, I can see her getting asked for ID until she's 60. Please go away now Amy, you are boring us now. Now, wistful acoustic-country music is not the kind of genre associated with MF, but Cookies N Beans - featuring Frida Ohrn from Oh Laura of "Release Me" fame - did their best with "What If" which, IMHO got a little boring as it went on...but you'd have to acknowledge that MF provided a very diverse collection of songs tonight. They were all just keeping the seat warm for Måns Zelmerlöw of course, with his second attempt at MF - "Hope and Glory", co-written with Fredrik Kempe. Was it "Cara Mia 2"? Was it "Hero 2"? Was it....a winner? Interval act - a flashback to MF in the 1970s with clips including Bjorn Skifs, Magnus Uggla and Lasse Berghagen. Oh and some little-known combo, I think they were called Abba....Sofia Jannok (no I don't know who she is) attempted her own individual version of "Waterloo". So to Duel 1: "1000 Miles" vs "It's My Life": H.E.A.T. to Globen, Amy to Andra Chansen. Duel 2: "Hope and Glory" vs "Show Me Heaven"....to Globen and Andra Chansen respectively. And what was that international jury thinking about? Amy? Huh? I did enjoy tonight's show, although I'm still shocked at Amy's success and Jennifer's failure. Still that's MF for you eh! But Måns is through - that's what matters! Another successful (but forgotten) act from the 1980s tonight: Fine Young Cannibals. "She Drives Me Crazy" was their biggest hit in 1987 http://www.youtube.com/watch?v=S_wzi-kTVOI although their debut hit "Johnny Come Home" http://www.youtube.com/watch?v=zUBE850kay0 is also well worth a mention. As indeed is "Good Thing" http://www.youtube.com/watch?v=rhBAVOvt-gU&feature=related whilst we're on the subject. The final obstacle was cleared yesterday to allow me to go over to Gothenburg for a weekend in April and finally live the dream of seeing my favourite singer Salem Al Fakir in concert, 9 weeks from tonight. I didn't get off the starting blocks though, as there was a problem - well maybe not a problem, more a setback - with the ticket booking. More on my ticket-trauma over at Planet Salem, and fingers remain crossed that I can resolve that so that finally, finally I can get there. I know I'm beginning to sound like one of those horrible reality TV contestants - y'know, "this is the only thing I've ever wanted, blah blah blah" but in this case it happens to be true. Nevertheless, where there's a will there's a way (what's with all these cheesy proverbs???) and in my case there's oodles of will so all I need is....a way. Right I'm off now to get ready for tonight's MF - it's Måååååååååååns mania at EuropeCrazy HQ!!!! See ya all later tonight. So "Hope and Glory", the little bit I've heard, may not have the greatness of "Cara Mia" (what does?) but I still think - FOOLISH PREDICTION ALERT! - that Måns Zelmerlöw will sail through to Globen in his James Bond suit. The other song that will go there with him....well I really don't know? It could be Jennifer Brown with her ballad with its old fashioned melody; that Duffy-style seems to be in fashion at the moment. Or it could be Markoolio, whose popularity continues to be a mystery to me. It sounded to me like Magnus Uggla in "The Lion King" - many other reviewers have made this comparison too. I can see where they are coming from. His reputation is probably enough to propel him to Globen or Andra Chansen but reputations don't always count any more; just ask Shirley Clamp. As for Amy Diamond, she could struggle - it's not much of a song. I don't like her kiddie-pop style but I have to admit that "Thank You" was quite a good pop song (choke) however this just goes nowhere. You can't go wrong with a bit of good old-fashioned hair metal, even if MF isn't really the right place for it, but H.E.A.T. deliver it rather nicely, with a little side of schlager to it. Makes up for the absence of the Poodles this year I guess. This could go either way, but if it's a night of 'reputation-qualifiers' then they're out. Lasse Lindh is trying for the 2nd year in a row with a Pulp-ish power-indie song which I think may grow on me eventually but it'll just be there to make up the numbers tonight. I think comeback stars Lili & Susie could be in with a real chance tonight as their song stuck in my memory after I played the one-minute clips (the only one last week to do that was Alcazar). It's like they've never been away. Swedish-Dixie-Chicks Cookies N Beans are probably the 'dark horses' tonight and may be different enough to get noticed, in the same way that Caroline af Ugglas did last week. So...prediction time. (I just know I'm going to get it wrong this week). ...it's all about "Hope and Glory". Yes that time has almost come - I can't wait to hear the song and I hope it doesn't disappoint. Apologies for the lack of posts on here, it can only get better :)) I've been very busy over at Planet Salem so apologies in advance if the little old EuropeCrazy blog gets a bit neglected over the next few weeks :( however I'll try my best to keep it going as best I can. Astronaut - Salem Al Fakir: more about this over at Planet Salem. Be warned: in just a few weeks it's going to be all Salem, all the time on this playlist. (So what' s new I hear you ask?). This is the next single and title track from his new album and it's so sweet and lovely and sums up everything that's wonderful about him. Which is a lot. Standing On The Shore/We Are The People - Empire of the Sun: not long now till the album is out, and I've already decided that it's my second-favourite album of the year even though I haven't heard it all yet. Change - Daniel Merriweather: at long last!! It's been a while since "Stop Me" but his solo debut album is on the way and this is the first single from it, which has entered the UK top 10 singles chart today - yipppeeee! A nice upbeat soulful sound with the man himself in good voice. Fearless - Bryn Christopher: once again I'm sad to say, criminally neglected and overlooked. What does this man have to do to get the success he deserves? Singing That Melody - Swingfly: Poster Girl was talking about him on her blog the other day and then I was watching one of the music video channels on Friday and this came on! Very catchy track indeed, already a massive hit in Sweden some time ago and now (hopefully) heading for the British charts!! Lose Control - Waldo's People: those nostalgic for early 90s Eurodance should love this. A very strong track indeed with a killer chorus and an irresistible beat. Great! Here is Lena Philipsson from 1986 with "Dansa i Neon" which if there was any justice in the world, should have represented Sweden that year. And what about Melodifestivalen then? Week 1 is traditionally the "rubbish one" but there were some big hitters in the line-up. Former favourite (but never winner) Shirley Clamp; old favourites Alcazar; TV talent show winners Scotts; former A-Teens member and Måns Zelmerlöw's girlfriend Marie Serneholt to name 4. I liked the Martin Stenmarck/Charlotte Perrelli segment at the beginning (ooh he's lovely isn't he???) when Martin sang and they threw this year's trophy all the way to the Scandinavium. Song 1: "Tick Tock" - Nina Soderquist. I missed more of this song than I actually heard due to the wonky live stream. She is such a powerful singer and I hope we haven't seen the last of her at MF, although she is still a bit scary and I wasn't really sure about that outfit, but a good start nonetheless. Song 2: "Welcome To My Life" - Jonathan Fagerlund. I knew straight away that this wasn't a qualifier, but despite this I think that it will do well outwith the competition. Very likeable. Song 3: "Med Hjartat Fyllt Av Ljus" - Shirley Clamp. The major surprise of the night, as one of the long-awaited MF comebacks crashed spectacularly. She is still a big, powerful dramatic singer, but this ballad was just Pling-by-numbers and didn't do her any favours, and she could have done without the wind machine at the key change. Song 4: "Jag Tror Pa Oss" - Scotts. Not the best song to ever grace an MF stage, but Scotts did the best with what they had, and Henrik is still quite an engaging frontman which usually guarantees a few votes. Which they got. Song 5: "You're My World" - Emilia. Something quite different now, but I had a feeling that this would qualify. Vocally she lacks the power of a Nina or a Shirley, but the song had enough charm to progress in the competition in what was judged to be a weak first semi-final. Song 6: "Stay The Night" - Alcazar. And now to the main course. Alcazar have been around at Melodifestivalen, on and off for the last few years, and it was so, so good to have them back. Make no mistake, they really really went for it tonight and finally got their reward. Song 7: "Snalla Snalla" - Caroline af Ugglas: I can't comment on this because it was a good excuse for a comfort break :) anyway IMHO it was the worst song of the night and I can't understand why it did so well??? Song 8: "Disconnect Me" - Marie Serneholt: I was pleasantly surprised by this and by the end of it I really thought we had a qualifier. (Apart from the numerous buffering-breaks which spoiled this MF heat for me). But hey, what do I know...? Major shock - Shirley hadn't made it. The duel-system has been introduced in the heats this year, with the winner going to Globen and the loser to Andra Chansen. Duel 1: Scotts v Alcazar. Result: Alcazar to Globen. Yaaaaaaaayyyyyy!! Duel 2: Emilia v Caroline af Ugglas. Now here's where it gets confusing. There is an international jury on board this year, and they'll choose one song per week, I don't know what happens after that? Anyway the international jury chose Caroline af Ugglas - ????? - she's already gone to Andra Chansen so I don't know how the jury thing will go. But anyway Alcazar are going to Globen so I'm sooooooo happy !!!!! When you're movin' up with Alcazar.....! "Stay The Night" to Globen! "Tick Tock": I wouldn't mess with her! This sounds like a powerful high-energy start to the show although I can't help but thinking the Poodles should have done it! (Same writers). "Welcome To My Life": Now I did actually quite like this, a nice slice of Swedish boy-pop. A little bit Jimmy Jansson-ish, only better. "Med Hjärtat Fyllt Av Ljus": Now we were never in any doubt that this lady sure can sing, but "Min Karlek" it most certainly ain't - it's a hands-in-the-air anthemic ballad in the "For Att Du Finns"/"Empty Room" style but left me cold. "Jag Tror På Oss": I really wanted to like this, but it's not really any great shakes however they bring back fond memories of Barbados for me. Their recent 'Dansbandskampen' fame should propel them out of this semi final. "You're My World": Easy going foot-tapping schlager which I think could be a dark horse on the night. I feared the worst and thought it would be another "Big Big World" (which I hated with a passion) but it's actually nice, if unspectacular. "Snälla Snälla": Oh Caroline, go away will you? These bluesy Janis Joplin-type things are well boring me now. "Disconnect Me": This suggested a bit of James Bond-drama meets Shakira or something, I'm very interested to see how this does although I don't think it's going to make it out of the semi. To Andra Chansen: Emilia and Alcazar. It's a big weekend as Melodifestivalen starts tomorrow night. I'll do a little preview of the songs tomorrow afternoon. I was reading a feature on Aftonbladet website last night which said that the quality of the first week's songs wasn't too great, but if you couldn't remember the chorus of Alcazar's song then you must be either deaf or dead !! Traditionally of course, week one is never as good as the rest, so it will be interesting to see if this is still the case. I've given up on being able to watch Norway's MGP, which is a real disappointment for me as it's always one of my favourites. At the moment my internet connection at home is playing up, which doesn't really help. Hoping that at least SVT deliver their usual quality stream. "Popcirkus" - a new Swedish TV music show well worth watching. "Popcirkus" is a new SVT2 show which started last week and already I am very impressed indeed. A great mixture of live music and interviews, and as if that's not enough it's co-presented by the legend that is Kristian Luuk! He's not doing Melodifestivalen any more but if you've got withdrawal symptoms for the great man, well now you know where to find him: check out http://svtplay.se/t/102881/popcirkus for the video streams of the show. This week's show featured live music from the lovely Christian Walz - by now a firm favourite on this blog - and the underrated Sebastien Tellier, who is making some of the most hypnotic modern music out there. Many, including myself, will have discovered him thanks to "Divine" but his other tunes are well worth checking out too. I'll be watching this show every week - I like it! I still can't get over it. All those weeks excitedly waiting for the British Eurovision song, written by songwriting heavyweights Sir Andrew Lloyd Webber and Diane Warren....only to find that it's a total pile of mince. A pile of X Factor/Idol winners song mince to be precise. All we needed was Peter Kay's funny-once-but-now-tedious comedy creation Geraldine to come on stage and start warbling "I started with nothing...." at least that was a spoof, what's the excuse for this? All through "Your Country Needs You" I wanted Mark to win, but having heard all three versions of the song I didn't really care in the end, it's such a dire song that it would still be dire no matter who sang it. As it was, the viewers chose Jade to go to Moscow. She had better enjoy her five minutes of fame, for yet another bottom-five placing probably awaits on 16th May! Her reprise at the end of the show was possibly the worst ever winner's reprise I've ever heard. The Twins were second, and they surprisingly delivered a half decent rendition of this so-called 'song'. Mark was third - and he was stitched up IMHO: giving a musical theatre singer two 'soul' songs to sing was a blatant attempt to put the viewers off voting for him, and then to have him sing "It's My Time" first, when the song was completely unfamiliar. Oh well...Royaume-Uni messes up again. And not for the first time either. Britain could take lessons in how to produce a national final from many of our European neighbours, who can fill stadiums with enthusiastic fans and deliver an absolute event, rather than an embarrassment in a small studio. Last night I watched my first ever Dansk Melodi Grand Prix final live on the internet. Mainly because I was completely frustrated yet again that I didn’t get to see this week’s Norwegian MGP heat. (OK, technically I did get to see it, but there was no sound on the live stream). Anyway I had a bit more success with the DMGP live stream although the signal did break up quite regularly and I couldn’t get through any of the songs without regular buffering interruptions. Song 1: "I’ll Never Fall In Love Again" - Trine Jepsen. This song was very "Hero"-ish, although her stylist let her down with unflattering headgear and those shorts. Song 2: "Lucky Boy" - Jeppe. I was particularly interested in this as he was a member of Junior Senior who did the fabulous "Move Your Feet" a few years ago. "Lucky Boy" was very 80s electropop-sounding and even though it didn’t really have a chance, I quite liked it. Song 3: "Crying Out Your Name" - Marie Carmen Koppel. Visually reminiscent of Sarah Dawn Finer in looks, but a bit less subtle in vocal delivery. A dull, bawling ballad. Song 4: "Det’ Det" - Sukkerchok. Song 5: "Alice In The Wonderland" - Jimmy Jorgensen. Still on the comparison theme, this reminded me in places of "Flowers In The Window" by Travis. A decent enough anthemic pop-rock song but again I didn’t really see it having any chance. He looked quite scary too, and it was a bit clumsily staged with the girls-with-guitars backing him. Song 6: "Someday" - Hera Bjork. The pre-contest fan favourite, this was a great big ol’ slice of schlager, as if someone had taken Shirley Clamp, Fredrik Kempe, added a helping of "The Winner Takes It All" and thrown it into a blender. Very good, and she seemed to have a nice warm personality too. By this point I had predicted this as the winner. Song 7: "Big Bang Baby" - Claus Christensen. I didn’t really see/hear much of this as I was watching the DMGP final and "Your Country Needs You" at the same time, and at this point Dima Bilan was on BBC-1 doing his usual understated (!!) performance of "Believe" - you’d think by now he’d have learned how to pronounce ‘impossible’ correctly - anyway he took off his jacket mid-song and Claus was abandoned...! Song 8: "Sindssyg" - Johnny Deluxe. Unfortunately my internet connection was really playing up so I missed most of this. The bits I heard were OK though. A bit like "Modern Love" by David Bowie. Song 9: "Underneath My Skin" - Christina Undhjem. I was a big fan of her song "Here" from the Norwegian MGP from a couple of years ago, but I couldn’t say the same for this. Even the nice moving stage-effect wasn’t enough to save this "Because of You" soundalike from flopping. Dull. Song 10: "Believe Again" - Brinck. Tonight Matthew I’m going to be Ronan Keating. Singing a song written by ....oh, wait, Ronan Keating!! (who wasn’t even there by the way - points deducted) This was quite a nice midtempo song and I liked the singer, Niels Brinck. Very cheeky though, putting in a song called "Believe Again" when last year’s winning song was called "Believe". I reckoned this would provide the closest competition for "Someday" and I was right. The superfinal was split into two head-to-head contests therefore we had "Det’ Det" against "Someday", and "Believe Again" against "Syndssig". Very interesting to see two of the final four songs were in Danish. The interval act - Birthe and Felix’s Eurovision medley - was highly entertaining. I thought they were a very likeable partnership, even though I still can’t understand a word of Danish. After the semi-finals came the result we expected: the schlager-tastic "Someday" (yes Rachel I liked that ‘destiny will work its magic’ line too) against "Believe Again". By this time I thought Hera had it in the bag - but she fell at the final hurdle as the voters chose "Believe Again" to represent Denmark in Moscow. I would have been happy with either of the songs winning so I didn’t really mind. It could have been worse: it could have been "It's My Time". Good news from Finland: my two favourite songs made it to their ‘superfinal’ - "Lose Control" by Waldo’s People and "Speakerbox" by Signmark, with Waldo's People winning with a lively and exciting performance. It's all very E-Type 90s Eurodance, which I like, although I hope it doesn't suffer a similar fate to "Vampires Are Alive" and fail to make it out of the semi-final. I can't hesitate no more! I am so happy tonight...."I'm Yours" by Jason Mraz, a song which I've loved for a long long time on this blog, and one which everywhere else in Europe equally loved long before the UK did, has finally climbed to no. 11 in the UK top 40 singles chart. The singles chart is pretty meaningless now and generally cluttered with dull r'n'b and overplayed radio rubbish, not to mention chavvy trash like Kid Cudi's "Day and Nite", possibly the worst thing to grace the top 5 since...well, the last worst thing to grace the top 5. So, for a nice little easy going song like "I'm Yours" to get into the top 20, it's a massive achievement indeed. Well done Jason. It's long overdue.